The Recreational Repair Stand is perfect for those who seek reliability, simplicity, and stability on a budget. 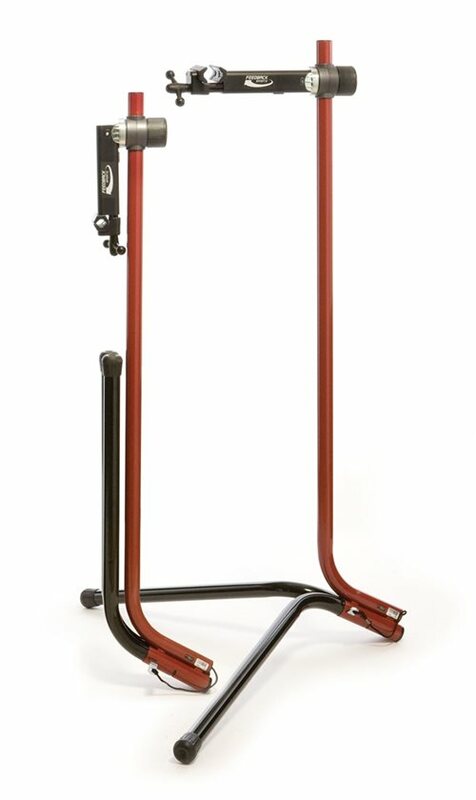 With the same quality construction you can expect from Feedback Sports, the Recreational Repair Stand features a 360 degree rotating clamp head with rubber coated jaws to protect your bikes finish and steel powder coated tubes to keep your repair stand safe from the elements. The spinner knob clamp head will accommodate up to 1.9″ tubing which makes securing a bicycle in the stand a simple task. The dual-leg base is stable and strong enough to support up to 60 lbs while the folding legs and clamp assembly make for easy storage when not in use. The Recreational Repair Stand is an excellent addition that will help make your bicycle maintenance a breeze. Spinner knob clamp securely holds bike. Legs and clamp fold for easy storage. 360 degree rotating clamp for added versatility. I am very happy with the stand. There are always times I wish I could adjust the height or keep the bike from turning on the arm, but I knew I wouldn't get that for what i was willing to pay. The stand is very solid and stable, and the savings in shop fees easily pay for it - besides the value of the pride that comes from maintaining your own bike! Nothing else comes close in this price range. I've used USS stands for music applications for 20 years, and their customer service and product engineering is unbeatable. They've essentially stripped down a few of the adjustment features, but left the core useability of their more expensive products intact. I was looking for something affordable to peform basic tune-ups on my Cyclo-Cross bike. The 50R comes right out of the box and sets up easily in seconds. No complaints. For the Money, Well Worth it! This is my first bike stand I ever bought and I still use it when I need something on the road. It gets very slim and I can throw this in my little compact car and go. The clamp has a spinning wheel type to lock the frame in place and that works fine for me. I have to hold the bike about 5 seconds while I spin the lock shut. I only wish it had the single lever throw clamp but for the price this is an Awesome stand. This is a really great stand for the price, I have yet to have any real complaint about it. It doesn't come with all of the bells and whistles but if you need a really decent stand on the cheap this is what you want! It gets the job done! The overall experience has been wonderful. Its handy and very sturdy. I would recommend it to any one who needs a great stand for a great price. The repair stand could be improved if it allowed the height to be adjusted. this stand is good for the weekend rider. to all the rides that are saying that the stand is trash. will if you bought this stand than you really were not looking for a pro style stand. Great for the money, it isn't a shop quality stand you aren't going to be working on bikes up side down and hammering BB's without the stand budging but great for general building and maintenance. What this means is that your bike will wobble on the stand. This has nothing to do with tightening the clamp onto your frame. There are three tubes, when unfolded are joined together with a flat piece of metal. Simple enough - except there is no way to tighten or secure the three tubes together. With my 20lbs road bike on the stand, I can push my bike and watch it rock back and forth on the stand like a pendulum. Called JensonUSA and was given the "no one has called with a problem like that" line. No surprises there - typical customer no-service response. Tried to call the manufacturer - they're all out of town! Wait to see if they'll be back next week. I'll try to post a video on youtube so you can watch the bike rock back and forth for yourself. Do not buy this product without assembling it first in the store. Don't even think of getting it through mail order. Buyer beware.